On witchcraft and mass psychogenic illness. 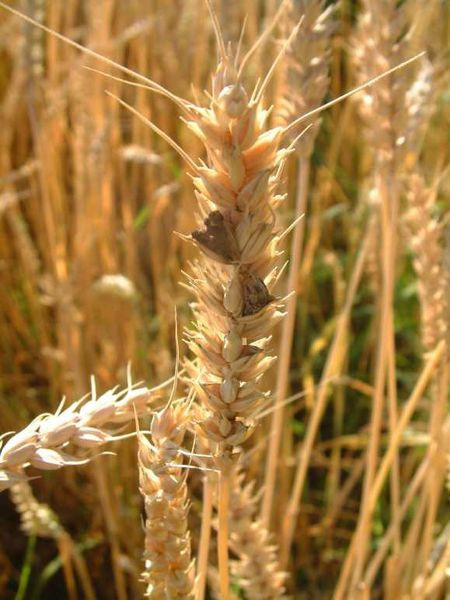 Because she is N’s best friend’s grandmother, I recently had the pleasure of meeting the researcher who first proposed that the Salem witchcraft trials were inspired by ergot poisoning of rye crops. And that, of course, is one of the papers I read while researching mass psychogenic illness / conversion disorders / violence against women. Does it seem controversial to throw that last categorization in there? Here’s a quick summary: mass psychogenic illness is typically diagnosed when people exhibit strange behavior and those who are making the diagnosis do not know why. If an episode involves more women than men, that’s considered an indication of mass psychogenic illness — even for contemporary diagnoses, actually, although we now know that women & men metabolize many small molecules differently, which means that equal ingested dosage will often result in higher blood levels for women. Maybe you read about the recent episode in New York (if not, I’d recommend another lovely article by Susan Dominus, “What Happened to the Girls in Le Roy”). Teenagers started twitching. Mostly young women were affected, environmental analysis identified no known toxins, doctors decided it was mass psychogenic illness. There are non-psychological reasons to believe that certain episodes of strange behavior, tics, convulsions, etc., would affect primarily women, but ever since the diagnosis of “hysteria” was first proposed (in which the womb forgets that it’s supposed to reside near a woman’s belly and begins to wander her body, eventually latching onto the brain and causing her to act strange) the medical community has assumed that most women’s problems are in their heads. Which isn’t to say that strange behavior like tics, convulsions, etc., cannot have an exclusively neurological cause. It can. There are physiological problems that can be caused solely by the brain — usually the initial onset is accompanied by high stress — and, unfortunately, the symptoms also recursively change the brain. It’s a little bit silly to try to distinguish between psychological and physiological problems, what with the brain also being part of the body, but with conversion disorders an ailment that began as thought will eventually become detectably imprinted in matter. In case you’re interested, here’s a nice open-source reference by Ali et al. discussing this loop. Despite my reflexive distaste for most of Malcolm Gladwell’s pithy summaries about how the world works — I’ve read enough social psychology papers to know that the findings are often much weaker than they seem when filtered through popular writing — that lovely phrase “the tipping point” seems very appropriate when thinking about mass psychogenic illness. There are two stable equilibria that you could roughly designate “acting strange” and “acting normal,” and at some intermediate point they transition sharply from one to the other. Here, I can draw a graph for you, using tarantism as a model case. Tarantism, you ask? People thought that spider bites would be fatal unless those bitten began to dance… so circa the 1380s, every summer there was wild, obscene dancing from Italians trying mightily to stave off death. 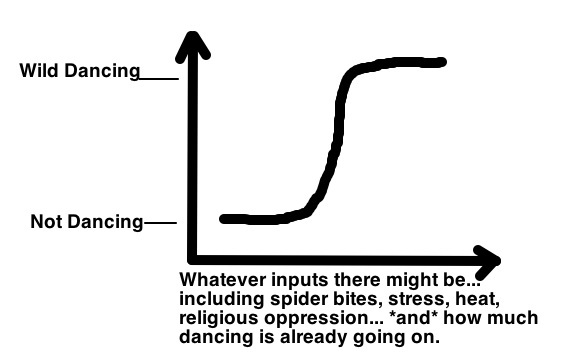 It’s the fact that the amount of dancing in turn contributes to the likelihood of more dancing, that lends the situation a tipping point. All else being equal, a world in which not many people are dancing will result in little dancing in the future, a world full of revelry will produce more rambunctious behavior. And there’s a point in the middle, when a small number of people have been affected, that could just as easily swing one way or the other… by next week the “danger” may have passed, or there might be a tremendous outbreak of tarantism. To reach a tipping point, though, there have to be many people experiencing similar levels of stress, along with whatever else might be needed to initiate a conversion disorder. Which is why I think it’s reasonable to think that outbreaks of mass psychogenic illness are a symptom of pervasive violence against women. They tend to occur primarily amongst people who have limited opportunities for self-expression: overworked schoolchildren, prisoners, convent residents, and women living in restrictive societies. And it is of course possible for other factors to contribute. That’s the main message I took away from Caporael’s ergotism study — for young women living in puritanical New England, who believed that witchcraft was a very real threat, it wouldn’t take much to push them over the edge. Exposure to a psychedelic drug could potentially do it. Caporael addressed this in her paper — the idea that neither ergot alone, nor a belief in witchcraft alone, would have resulted in the trials — and suggested that the paucity of similar accusations during that time period lends further credence to the ergotism hypothesis. Altogether, it’s a nice little paper. Plus — and this is something I didn’t realize when I first read it — it’s a single-author Science paper written by a twenty-something year-old graduate student based on research she’d done as an undergrad. The only publication I have from my undergraduate research is an author contribution buried somewhere in the middle of a long list of researchers… for an article that landed in Blood. Somewhat lower tier than Science. In fact, my only real objection to Caporael’s paper doesn’t address the underlying research. 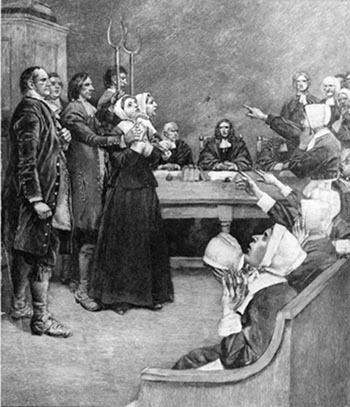 It’s that I believe the ergotism hypothesis lets the perpetrators of the Salem witchcraft trials off too easily. Hearing that the accusers might have inadvertently ingested psychedelic drugs (for months!) might make their actions sound less heinous. And, look, we’ll never know for sure. Salem’s inhabitants might’ve been under the influence of lysergic acid for that whole time period. But I think it’s worth pointing out that similar abuses have occurred in the absence of any confounding psychedelics. Outbreaks of a wide variety of diseases in Europe caused people to blame and murder their jewish neighbors. Outbreaks of a wide variety of social strife in the United States caused people to blame and murder their black neighbors. Even the Stanford Prison Experiment documents how easily an imposed worldview can bring forth evil. If those Stanford students had been indoctrinated from birth to believe in witchcraft and an omnipresent Satan striving to destroy their society, they probably could’ve been convinced to start dunking their classmates in order to identify the witch. My brother & me. 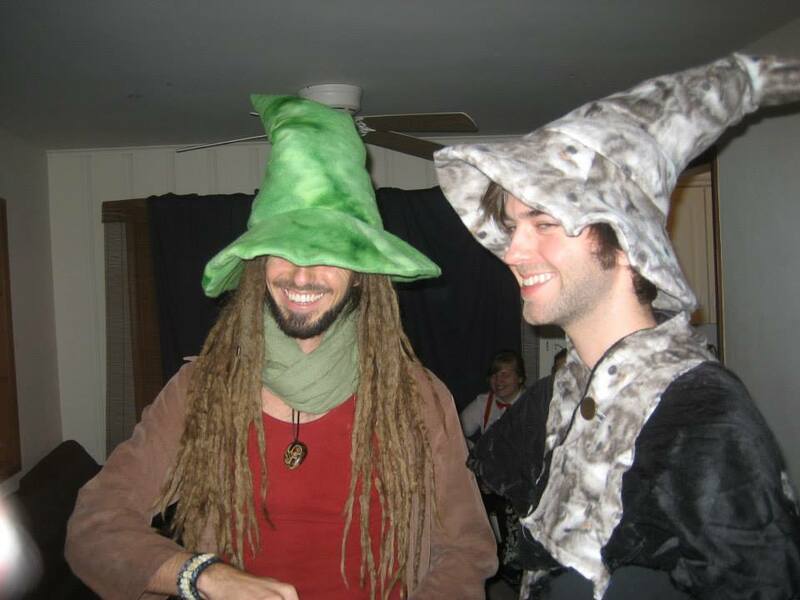 Luckily no one accused us of witchcraft; given our garb, I doubt we coulda beat the rap. Links to my writing elsewhere: On Darth Vader and the Homunculus Theory of the Mind. On uncertainty (with cartoon ending).